I have been wanting to buy a Dutch Oven for a long time, but have never gotten around to it. I envision making delicious pot roasts with carrots and potatoes inside of it. Even though truthfully I don’t really like pot roast. But maybe if I had a dutch oven I would. Yes, that is just how my mind works. In fact, when I was shopping for Christmas I picked up a Le Crueset one at TJ Maxx and put it in my cart, but my son made me put it back because it was made in China. Kids, sheesh, always paying attention to what you say. Wise blog readers then told me it was an imitation anyway since the real ones are made in France. 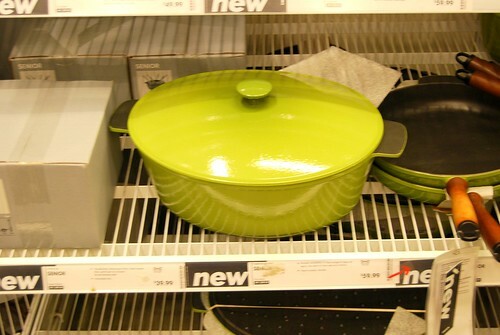 So when I saw this one at IKEA on Saturday, I ran over to it. Yes, ran, maybe even shoving small children out of the way. “I need this!” I said. I carried it back to the cart. Looked it over. It was so heavy and sturdy. I sighed deeply. The color green was so pretty. I caressed it. Then carried it back to the shelf and left it there. $99 and I didn’t buy it. That is the amount of money my American Express bill says that I spent at Target last month, JUST between the days December 20th and December 24th. Eight hundred and fifty-three dollars and TWENTY EIGHT CENTS. Which is shocking. So shocking in fact that when my husband mentioned it I was sure that he was mistaken. If I had spent that much money wouldn’t I at least know what I spent it on. Wouldn’t I be able to remember what it was that I bought at the store? A store I went to FOUR different times on as many days? Off the top of my head I can account for about $275, which were some last minute Christmas presents to even up the uneven piles and some things for relatives that I had left to the last minute. What the other almost $600 went to, I have no idea. Some of it probably went to food items, though since our Target isn’t a grocery store it is unlikely that grocery items amounted to very much. This is what I dropped off at Goodwill this morning. Three cardboard board boxes filled with books, a milk crate filled with books, and two large black bags filled with clothes. Going hand in hand with our resolution to not bring any more stuff into our house, we are also going to actively work this year on getting rid of the clutter. Our clutter is the hidden kind. The kind that lurks deep in the back of closets. The unopened boxes in the attic that have been with us for 13 years and moved with us, and yet have never been unpacked. We have lots of those. The boxes books saved from college that serve no purpose other than to remind me that once upon a time I read books with big words and discussed those books with other smart people. And I had ideas, lofty ideas that I was passionate about. And I was well rested. All those words have long since left the lexicon of motherhood and have been replaced by words like poop, Target, and a good nights sleep. I actually had to just look up the word lexicon because I wasn’t sure I was using it correctly. Goodbye brain, I have hardly missed you. And then there are my neatly organized bins of toys that have not seen the light of day for years. What am I saving them for? Will there be a toy shortage one day? So this week was week one of the purge. 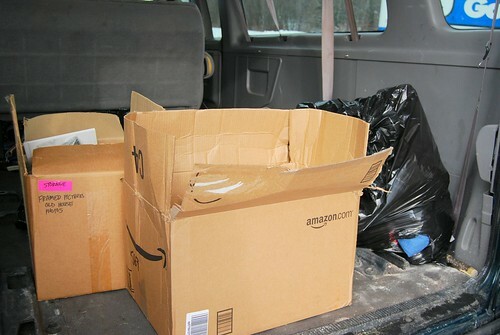 I filled one large black garbage bag with stuff for Goodwill and four fully packed boxes of books. It didn’t even make a dent. Sometimes when you are embarking on a big project it is hard to know where to start. I stood up there in my attic looked around. This is the point where I am tempted to walk away, overwhelmed. And then I try to justify it by saying that everything is organized and in neatly stacked boxes, who is it really hurting? It isn’t like we don’t have room, we have plenty. But the bigger point is that I do not need that stuff up there. I feel the weight of it on my shoulders. Every time I buy yet another storage container so I can store more junk, it weighs on me. So every week I am going to purge. I am going to be ruthless about it. And I am going to keep at it every week until there is nothing left. Even if one week I only find the time to empty out junk drawer. Fifty-one more trips to Goodwill left to go. 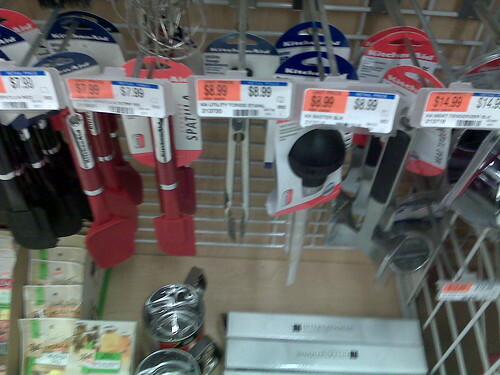 See those metal tongs that cost $8.99. I picked them up and then decided that I really didn’t need them. I already have two pair of these identical tongs. I wanted a new pair because the other ones are old and battered up looking. But they still work. Three days down, 362 to go. 1. Given how many kids’ birthdays you have, do you get them gifts you buy and if yes, will that have to follow the rules? I can’t imagine a 5 year old getting too excited over new underwear…just wondering how this will work. Chris says: Well, I have until February 29th to figure this one out. I am not sure. I strongly feel that the kids have a voice in our family. I am hoping to get them on board with a fun family outing as a present. For example the aquarium that they have all been wanting to go but is rather expensive. Or maybe some sort of art, music lesson, or some needed sports equipment. 2. What about cravings for something? I know you have food allergies, but I myself know that the incessant thought about chocolate on the way home from someplace will have me stop somewhere specifically to pick up the chocolate if there isn’t any at home. So where would I draw the line here? Do I really need the chocolate? Or is this a want? Frankly, if I hadn’t stopped tonight to get the chocolate I may have been a tad irritable, so is prevention of irritability with said chocolate a need or want? Just wondering. Chris says: Hmmmm, I don’t know. 3. What about other people’s gifts? If you get invited to a wedding, funeral, birthday party, anniversary, will a gift for them follow specific rules? Chris says: Do you need to bring gifts to funerals? And at this point, I do not think that I would have to follow any sort of rule regarding gift giving to other people. I usually give money. I am not trying to save money or be frugal. I am trying to stop the mindless accumulation that clutters my house and mind. 4. Is diet coke a want or a need?! Chris says: I gave up regularly drinking soda awhile ago. But I think it would have to be for each person to define on their own. Coffee for me is a need. but I drink it at home with my French Vanilla non-dairy creamer, also a need. 5, Do I “need” or “want” that under-sink shelf system I saw on Amazon.com? The cabinet under my sink is an utter mess, and completely unhelpful. I think the shelves would help. But would they really? is it a want or a need? I’m not sure. Chris says: This is why we have all pedestal sinks. No crap to collect under them. 6. Do I “need” or “want” those books? I meaning, reading is awesome, and all…. but is it possible to get them from the library? what if the library does not have the book I want to read? Chris says: I have decided not to buy any books for myself. Most of them I don’t need to own. I am looking towards my library now for books and trying out that crazy interlibrary loan thing. 7. What if it is something I could use over and over again for the kids in our homeschool? hmmm. where is the line? Chris says: Do you know this was one of the first questions that my kids asked? School supplies are necessities. I tend to think of them as tuition. If they were going to a private school I wouldn’t suddenly stop paying for it. I have almost everything that we need to get us through the school year, so maybe I’ll have to get back to you. I walked through the aisles of my local Target. So many things to buy and bring home. Things I didn’t even know that I needed a few moments before. And yet I manage to fill my cart with these things. Every week. Somewhere along the way the line between needs and wants was blurred, as I suspect it has been for many of us. I don’t need much, but I want a whole helluva a lot of things. At least in the moment I want them. I’d like to say that I had an epiphany then and left my cart full of stuff that I didn’t need and went home. But I didn’t. I brought home that 8ft tall pre-lit Christmas tree, a pencil sharpener, a new travel mug, pajamas for my daughter, a pair of sunglasses, coffee, and a plaster cast Santa. And I justified every single one of those purchases in my mind. You are currently browsing the A Year Off weblog archives for January, 2008.